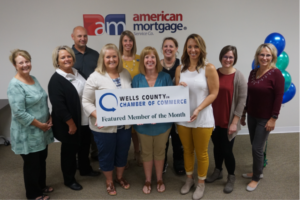 The Wells County Chamber of Commerce staff and Ambassadors recognized Angie Topp, Jessica Beste, and Pat Meyer of American Mortgage located at 1169 North Main St, Bluffton as the October Member of the Month. American Mortgage opened five years ago with Angie Topp being the driving force for the company coming to Bluffton to manage this office. American Mortgage has been in business for 43 years and currently serves a total of 40 offices in the US, mostly in large cities. Topp’s experience is extensive being in the financial field for 30 years and over 25 years specializing specifically in mortgage loans. American Mortgage provides services for all mortgage types from first time home buyers, refinances, repeat buyers, jumbo loans, and home investments. “If you can live in it, we can finance it,” said Topp. Topp credits their ability to take the time with each client, ask questions, and research information to ensure the clients decision is the best. “That is what really sets us apart,” said Topp. Pat Meyer is the Loan Assistant and first impression of the business; “and she makes us look good,” said Topp. Jessica Beste, Mortgage Originator, has been with American Mortgage for three years and in the banking industry for 11 years. American Mortgage has been a major sponsor for the Family Centered Services Annual Duck Race, supporters of Forgotten Children and many other nonprofits and local school activities. Topp and Beste are members of the local BNI Group, Connect Group, and activity involved with the Wells County Chamber of Commerce. “Today is very humbling because there are so many good businesses and people in Wells County and we appreciate the recognition for our hard work. Being recognized from the Chamber of Commerce means more than anything,” concludes Topp.